The Variations on a Rococo theme, Op 33 were written in Moscow in December 1876, while the composer’s tenure at the Conservatoire was slowly dragging to a close, and his lucrative, epistolary relationship with von Meck beginning to flower. Although he resented the hours teaching that prevented him from composing, Tchaikovsky had nevertheless made some enduring friendships at the Conservatoire, among them the cello professor Wilhelm Fitzenhagen, who had taken positions in Moscow after refusing an offer from the great Franz Liszt to remain with his orchestra in Weimar. 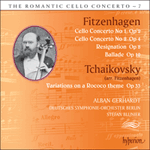 No cellist and famously riddled with self-doubt, Tchaikovsky had agreed to a number of alterations suggested by Fitzenhagen, for whom the work was composed, and it seems to have been this ‘original’ version which was premiered in November 1877, in Moscow, under Nicolai Rubinstein, with Fitzenhagen as soloist. So far so good. However, Fitzenhagen had further ideas of his own for the piece and set about ‘improving’ the work; substantially altering the solo part, tagging endings on here and there, shuffling the movements and even omitting the final variation altogether. ‘Horrible Fitzenhagen insists on changing your cello piece…and he claims you gave him permission. Good God!’ wrote the unconvinced publisher Pyotr Jurgenson to the composer. Nevertheless, the piano score was published in 1878, presumably without the composer’s approval, and the orchestral score appeared some years later, in 1889, both ‘revised and corrected’ by Fitzenhagen. In the case of the piano score, Tchaikovsky’s seeming reluctance to get involved may have been in part due to the extensive travels undertaken to shake off the horror of his badly-judged and swiftly-aborted marriage in 1877. And in the case of the publication of the orchestral score, a furious, and either accepting or resigned Tchaikovsky famously declared, ‘The devil take it. Let it stand!’. And so the Fitzenhagen version of the Rococo Variations remains the standard version of the piece—even to this day. Not until 50 years after Tchaikovsky’s death did the composer’s ‘original’ version come to be heard in the concert hall, its first modern performance documented as being by Daniil Shafran in 1941. The Soviet-published edition of 1956, the composer’s ‘original’ score, obviously still retains much of Fitzenhagen’s initial and, indeed, subsequent revisions to the cello part, but the variations are restored to Tchaikovsky’s original plan. The Rococo Variations reflects Tchaikovsky’s adoration of the music of Mozart, a composer he revered above all and referred to as the ‘Christ of music’. The poise and order of the music of Mozart and his time appealed greatly to a composer we regard as representing of the heights of the so-called Romantic period. 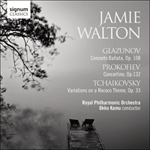 The work has a brief, almost subdued, orchestral introduction leading into the refined charm of the cello theme—not an 18th-century original, but rather Tchaikovsky’s idealised view of such a theme. Thereafter the cellist barely draws breath, the melody expanding into ever more expansive declarations, duets with the flute and the clarinet, cadenzas and a virtuoso package of classic cello cantabile, pizzicato, double-stopping, nostalgic waltzes, runs and trills until the coda brings us to an invigorating conclusion.